I love rhinestones! I love the Olympic games! AND I love my Silhouette Cameo! 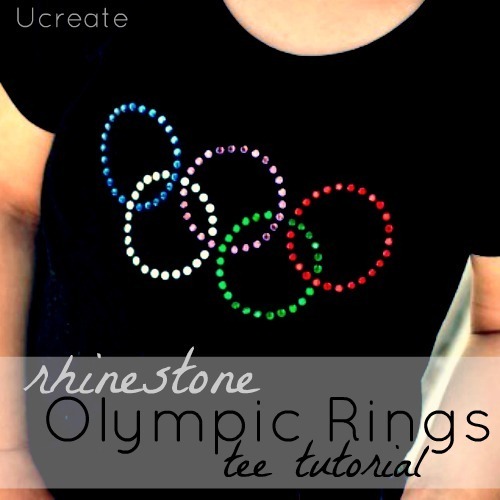 So I combined them all together and create a rhinestone Olympic rings tee. You guys, it turned out so well that I have to share a tutorial with you. 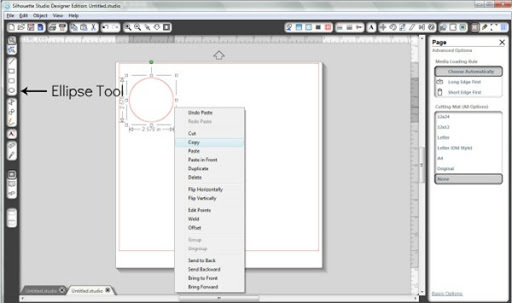 I am going to show you how I made this tee with the Deluxe Edition Silhouette Software. Normally you would be limited to the Rhinestone Designs in the Silhouette Online Store, but with this software you can customize and create original designs. I kept it simple and used only circles. STEP 2: Copy and paste the circle 5 times. 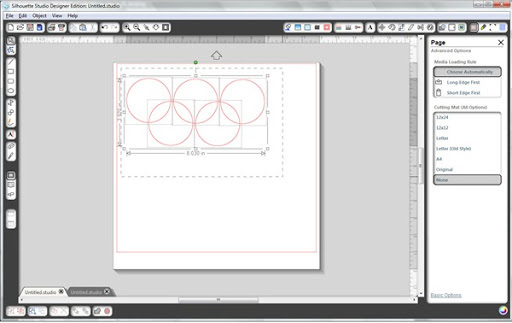 STEP 3: Move the 5 circles into place to create the Olympic Rings. STEP 4: Highlight all the rings in one big box. 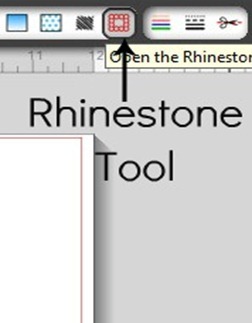 STEP 5: Click on the Rhinestone Tool located on the top menu bar. Click the size of Silhouette Rhinestones you are using. For this project I used 16ss. You can adjust the spacing and see what you like, but I usually just leave it on 1. At the bottom of the sidebar you will see how many rhinestones you will use for the image you are creating. 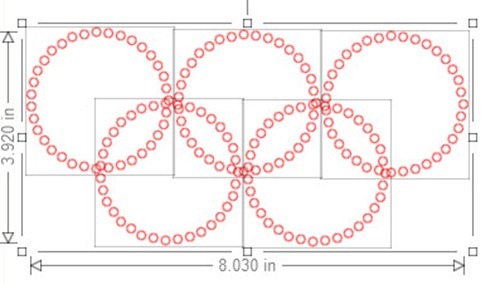 STEP 7: Let’s fix where the rings intersect. Click one of the rings and move it until it lays exact with the “rhinestone hole” of the ring next to it. I don’t use the mouse with this process. The keyboard arrows are more exact. 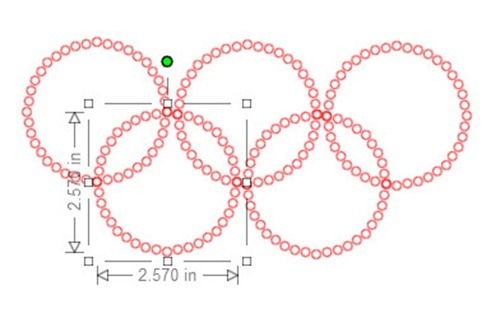 Work on all the rings until they all intersect nice and pretty like the above picture. STEP 8: Cut it and create your masterpiece according to the instructions that come with your Rhinestone Kit. One helpful tool when working with the Silhouette Rhinestones is the PICK ME UP TOOL. This thing is amazing. I couldn’t image trying to pick up every rhinestone with my adult fingers. Even tweezers were a pain. 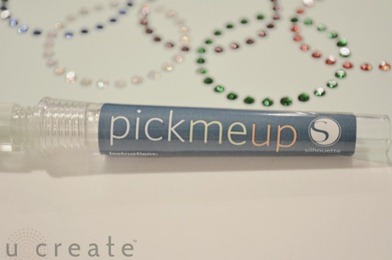 The Pick Me Up tool has a sticky stretchy tip that picks those tiny gems up with ease. It is a must have! I had a lot of fun playing with these rhinestones. And I am pretty sure this tiny person likes her “sparkly shirt.” She is such a character! 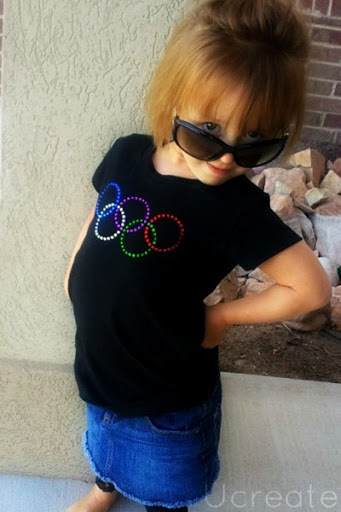 Check out the AWESOME Olympic Games Party we had for our nieces and nephews. Awesome. Love the attitude on your little model. I love this!!! Especially since my cousin is trying out for the Olympics next week!! !